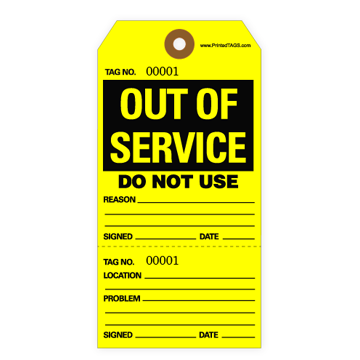 Out of service tags are an essential part of maintaining operational safety standards. 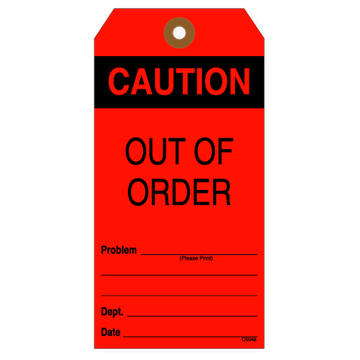 Out of service tags or warning tags are a highly effective way to label unsafe equipment or dangerous materials. Our out of service tags feature bold colors to grab attention, are made from durable materials and have a write-on surface for detailed instructions or information. Size: (#8) 6-1/4" X 3-1/8"
Subscribe to our mailing list for special offers and news! As an industry leader in high-quality tag printing, we offer a wide variety of in-stock and custom solutions. PrintedTags.com is a convenient source for the materials and colors to meet the requirements of virtually any industry. Best of all, we work quickly. We’re proud to offer the fastest turnaround in paper tag manufacturing. Shop online for popular sizes and styles, or request a custom quote for the exact specifications you need. Copyright © 2019 PrintedTags.com. All rights reserved.